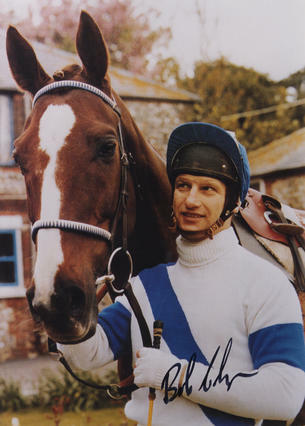 This is a superb In Person signed Colour 11" x 8" Photo of the retired Jockey on Aldiniti the horse he rode to victory in the 1981 Grand National " against all odds "
Robert "Bob" Champion MBE (born 4 June 1948) is an English jump jockey who won the 1981 Grand National on Aldaniti. Champion was diagnosed with testicular cancer in July 1979. He was treated with an orchidectomy and with the chemotherapeutic drugs bleomycin, vinblastine and cisplatin, and also had an exploratory operation to identify cancer in his lymph nodes. His victory on Aldaniti was viewed by many as a great triumph, following his previous adversity. Their victory earned them that year's BBC Sports Personality of the Year Team Award and was chosen as one of the 100 Greatest Sporting Moments by Channel 4 viewers in 2002.